No Burgers or Chips just a traditional dish from New Orleans, try our newest pop up dish “Jambalaya” for only $19.50 this Autumn. Can you feel summer is slipping away? So get ready with the abundance of Autumn as Burger 10 Sydney brings you its newest pop up dish to kick off Monday 20th March 2017, a new concept from Executive Chef Hussein Jaber who is determined to showcase the best of his home and international cuisine by taking you to another journey around the world. This time its no burger or chips just a traditional and famous dish from New Orleans “Jambalaya” South Central of USA whilst adding Australian twist. 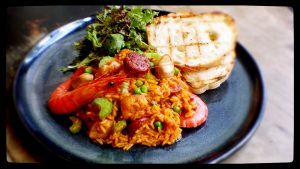 Jambalaya, the quintessential dish from New Orleans is a meal in itself a lavish serving plate of sautéed prawns, chicken, and chorizo sausage with rice infused with herbs & spices cooked in a tomato broth, consider it a new version of paella. This dish is served with Mesclun salad and charred bread. New Orleans boasts one of the richest culinary experiences that the United States has to offer, Creole Jambalaya originates from the French Quarter of New Orleans, in the original European sector. It was an attempt by the Spanish to make paella in the New World, where saffron was not readily available due to import costs. Tomatoes became the substitute for saffron. “We choose Jambalaya as our first pop up dish because of its vibrant history and we wanted to offer alternative option to customers and get away from the stereotype in the burger industry. Burger 10 aims to provide added value to its customers, the current generation of foodies today views food as an experience and that is who we are, we take them to a journey around the world and experience ultimate food adventure” Chef Hussein commented. You can grab this new pop up dish starting Monday, 20 March 2016 for limited time only! 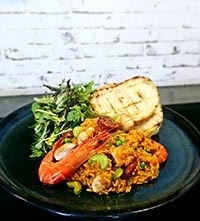 Selling at $19.50 a huge serving plate of sautéed prawns, chicken, and chorizo sausage with rice infused with herbs & spices cooked in a tomato broth served with Mesclun salad and charred bread, available for dine in and takeaway. Burger 10 staples 10 uniquely handcrafted burgers bringing the best flavours of 10 different countries from across the globe. Burger 10 has recently been selected as 2017 Australian Small Business Champion finalist for Fast food/ Takeaway store category and recently awarded as 2016 City of Sydney Business of the Year & Outstanding Fast food and Takeaway by Inner West Local Business Awards.